Hosam Katan/ReutersRebel fighters carrying weapons move towards their positions on the Karm al-Tarab frontline in Aleppo October 30, 2014. With moderate rebels facing defeat by al Qaeda in Syria’s north, groups holding a corner of the south are seeking a higher profile and more help, as the last Western-backed forces holding out against both President Bashar al-Assad and the jihadists. 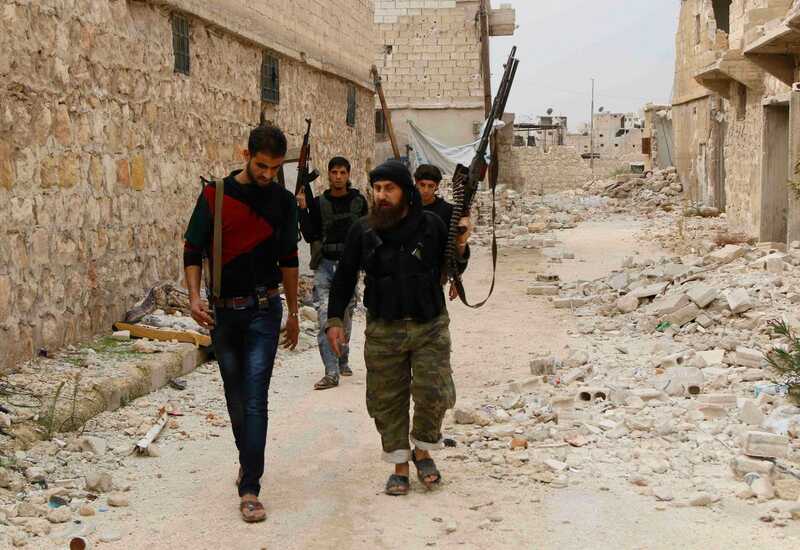 The southern rebels, described by Western officials as the best organised of the mainstream opposition, say they are the last hope for a revolution hijacked by jihadists. In recent days they have laid out a transition plan for a Syria without Assad, taking on a political role that in the past they left to others. Washington says backing “moderate” rebels is central to its new strategy to defeat the jihadists without helping Assad, put in place since the United States began bombing Sunni Islamist fighters from Islamic State in Syria in September. But since the U.S. bombing began, many Western-backed rebel groups have been hammered by both the government and jihadists. Last week, al Qaeda’s Syria branch, the Nusra Front, routed pro-Western rebels in one of their final strongholds in the north. Assad’s forces control Damascus, the Mediterranean coast and much of the area in between. Islamic State, an al Qaeda offshoot, controls the east, while Nusra controls much of the northwest and is expanding at the expense of moderates. The southern provinces near the Jordanian border are an exception, where rebels calling themselves the “Southern Front” still control territory and have managed to resist Assad while avoiding direct clashes with the Nusra Front. Last week, 15 groups in the Southern Front drew up a political program, a step which separates them from the exile-led opposition widely seen across Syria as a failure. As the rare non-jihadist movement which still controls territory, they hope to receive more aid from the West to avoid suffering the same fate as Western allies who have been crushed by jihadists and government forces elsewhere. 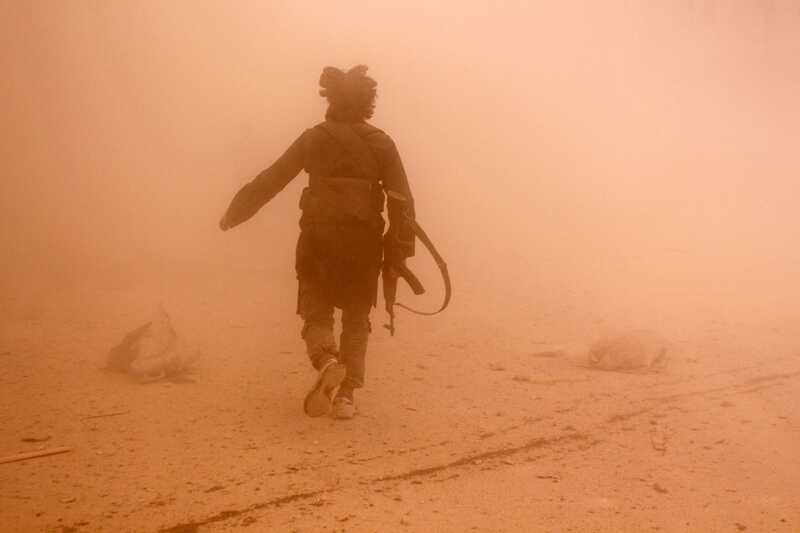 Rami Zayat/ReutersA rebel fighter runs through dust towards an area damaged by what activists said were barrel bombs dropped by warplanes loyal to Syria’s President Bashar al-Assad, in Aleppo’s al-Shaar neighbourhood November 6, 2014. In the past, rebels on the ground have mainly steered clear of politics, a subject left to umbrella groups like the largely exile-based National Coalition, which meets in Turkey. But leaders of the Southern Front say they have decided to take political issues into their own hands. “We did not get involved in these matters before. We left them to others. But now it is time. We can no longer risk squandering Syria,” defected army officer Abu Osama al-Jolani, 37, southern commander of the Syria Revolutionaries’ Front, told Reuters in an interview over the Internet. Their plan, still unpublished but disclosed to Reuters, calls for turning the Southern Front rebels into a civilian security force. National institutions including the military would be safeguarded, and a technocratic interim authority would be set up to be followed by elections. The plan emphasises protection for all Syrians regardless of religious, cultural or ethnic affiliations – language apparently aimed at reassuring Assad’s Alawite sect and Christians who fear the alternative to him is a radical Islamist government. It could be in line with thinking in Washington, where CNN reported Obama wants a policy review, realising Islamic State may not be defeated without a transition and Assad’s removal. Abu Hamza al-Qabouni, a rebel leader from Damascus and part of the Southern Front, said the group had decided to move ahead with a political plan because there was no longer any point waiting for the war to be resolved countrywide. The movement could later grow to include other groups that also hold real power on the ground, said Bashar al-Zoubi, whose Yarmouk Army is one of the strongest groups in the south. The effort presents a challenge to the Western-backed opposition coalition based in Turkey, which has little sway on the ground but claims political authority over the “Free Syrian Army” (FSA) uniting mainstream rebel fighters. The southern rebels “want to present themselves as a viable alternative to the Free Syrian Army in the north and the coalition, which was stillborn,” said Fayez al-Dweiri, a retired Jordanian general who follows the Syrian war closely. Apart from in the south and pockets in Aleppo, “the FSA has been effectively decimated and no longer effectively exists,” Dweiri said. A short drive from Damascus and bordering Jordan and Israel, the south is strategically important. Countries that oppose Assad could increase pressure on him by arming rebels there. But foreign support has so far been limited, helping the rebels hold ground but not allowing a major advance northwards. Meanwhile, Nusra Front is moving in. It set off an international crisis in September by seizing dozens of U.N. peacekeepers on the Golan Heights. So far, Nusra has fought alongside the southern rebels against Assad’s forces, although the rebels say there is no coordination. Dweiri, the Jordanian general, said Nusra had not tried to impose its sway over the southern rebels because the south was the one area where the non-Jihadists were stronger. Jordan’s tight control of the frontier means the south has not been infiltrated by foreign jihadist fighters to the same extent as the north, where Nusra and Islamic State have gained from the arrival of hundreds of militants via Turkey. Aid to southern rebels flows through Jordan, where a joint operations room of Western and Arab states funnels support to vetted groups, according to officials familiar with the process. Arms began reaching the southern rebels earlier this year. “Support brought excellent results, particularly the TOW missiles which reduced the effectiveness of their tanks,” said Zoubi. But he added: “We need more”.